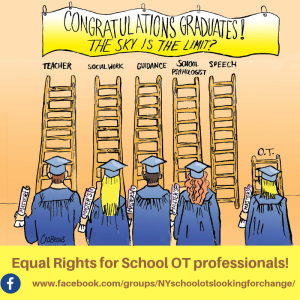 We want our children to keep up, but we don’t want to force a skill that they aren’t ready for. It’s a tricky situation. The good news is, the majority of students are able to keep up and learn these new skills even though we are presenting them much earlier. Here is the bad news: the children who are a little weaker often try to compensate to keep up with their peers. They form the letters improperly, use the wrong positioning to hold their pencil, and develop poor handwriting habits in general. So what can you do to help? A lot! 1. 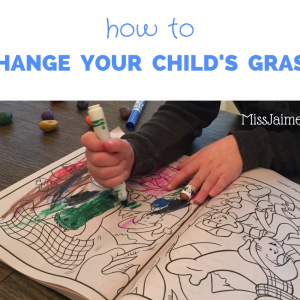 It’s easy to work on handwriting without picking up a pencil or crayon. 2. Just because it looks nice, doesn’t mean it is correct. 3. The way the child writes a letter is much more important that what it looks like when he’s done. 4. Children enjoy writing when they feel successful. 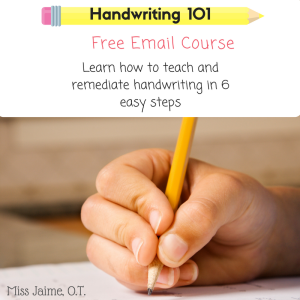 Take the FREE Handwriting Email Course for tons of handwriting tips and tricks. 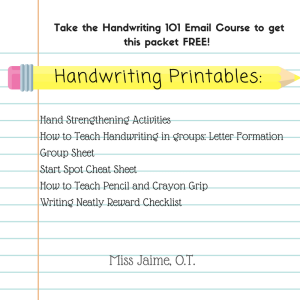 Plus, get a free packet of handwriting handouts (perfect for parents and teachers)! Try these activities to practice writing without a pencil. Cut a tiny piece of a kitchen sponge and wet it, then use it on an easel. Download “I write words” to your Ipad or Iphone and use your finger or a stylus. Write your name in the sand at the beach or draw it in the dirt at the park. Children like anything that is fun and different. So make it fun and different! Many parents don’t realize that their child is developing poor writing habits. They are excited that “Jimmy” is writing his name at all. It’s great that he is interested in writing and excited to make his name, but it is just as important that he learns the letters in his name correctly. Once a child develops a habit of writing a letter incorrectly, it is hard to change! Think of how many times a preschooler or kindergarten child writes their name each day. It is better to stop a child and instruct them in the proper formation of each letter than to let them write it incorrectly over and over. Writing letters with proper formation helps with legibility and speed later on. It doesn’t seem as important in the younger grades, but it has a big impact later on! 3. THE WAY A CHILD WRITES A LETTER IS MUCH MORE IMPORTANT THAN WHAT IT LOOKS LIKE. Again, letter formation is very important. So is pencil grip. 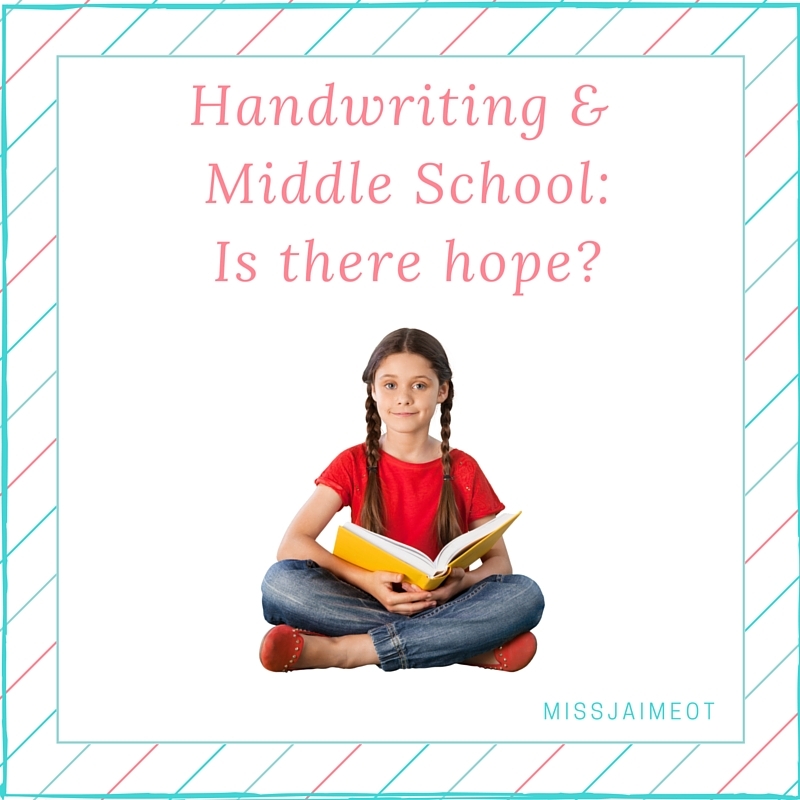 The students who have difficulty writing in third and fourth grade are usually students who developed poor writing habits when they were preschoolers or kindergartners. If they aren’t holding their pencil correctly, they may be using the wrong muscles to write. Then, as they write, they are missing out on valuable fine motor strengthening. Get your grip reward chart here. The most common problem is that children use their whole hand or arm instead of their fingers to move the pencil. This makes them tired as they write for longer periods of time. You can help this by having them write or color while laying on their bellies. If they are using their arms and elbows to hold themselves up, then only the fingers are left to move the pencil! Children’s letters often look misshapen or lopsided. That’s OK! If they write them with the proper formation and correct pencil grip, the motor control will come. First thing is first! 4. 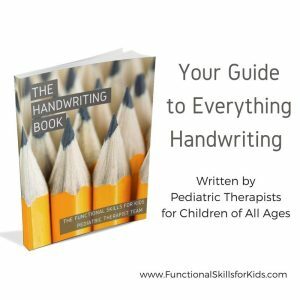 CHILDREN ENJOY HANDWRITING WHEN THEY FEEL SUCCESSFUL. Small children have small muscles. They really shouldn’t write or color for more than five to ten minutes at a time, especially if they don’t enjoy it. 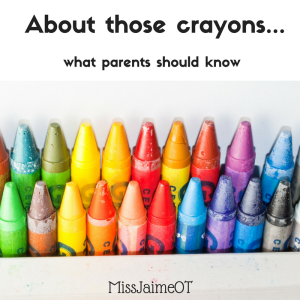 And they shouldn’t be participating in handwriting activities that are not developmentally appropriate. Three and four-year-old children are not ready to write a page of lowercase letters. Period. 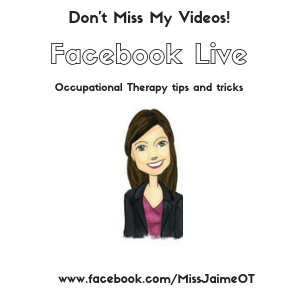 Offer fine motor games, play-doh, and crafts to help build strength in their hands. Practice letters and tracing with some of the ways listed above. Change it up and make it fun! Praise your child when they make a letter correctly, and correct them when it is wrong. You are doing them a favor! Handwriting is a lifelong skill. It needs to become automatic, so a child can concentrate on their thoughts, which are much more important. 5. Check your child’s pre-writing skills BEFORE you jump into writing. I am so happy that you bring up children being pushed into writing skills before they are ready and then follow up with some helpful ideas . 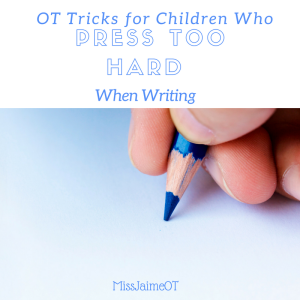 So many kiddos develop bad writing habits by starting before they are ready. There is so many things we can do…including educating pre-school and early elementary teachers to make sure these kids are using the right tools and even incorporate activities to help prepare their development before jumping right into getting those letters on paper. 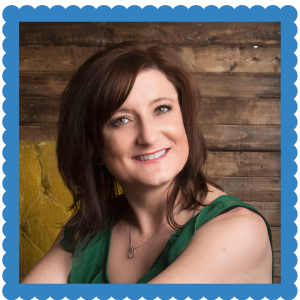 Anyhow…thank you for sharing and I will definitely pass on your ideas to my staff. I know! 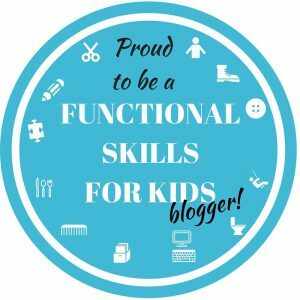 I wish the preschools would focus more on fine motor and strengthening skills!